Toban-yaki means to roast on a ceramic plate. Ceramic plates continue to emit heat for a long time after removal from their heat sources, and also have a significant heat radiation effect. Therefore, ceramic plates are perfect for roasting ingredients in an even fashion. 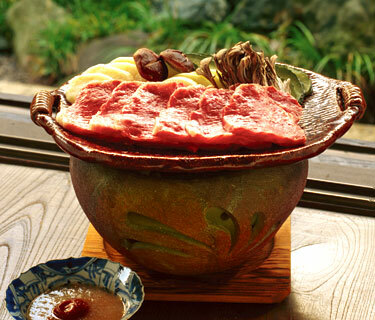 Kobe Beef, with its characteristic fine marbled texture, can be roasted on such plates, producing a tender and juicy steak. 1) Cut pumpkin into wedges. Peel potato and cut into round slices. Microwave them for 30 sec. at 600W. 2) Cut off the lower stem of the shiitake mushroom and make an X-shaped cut at the top. Divide maitake mushrooms into small portions. 3) Cut onion into semicircular slices approximately 3/8 in. (1cm) thick. 4) Slice beef into 3/8 in. (1cm) thick. 5) Prepare seasoned sake. Place kombu, sake and umeboshi in a pan over heat. Boil down until fluid is reduced by one third. Add grated Japanese radish. Add some salt or citrus juice after cooled, in accordance with your taste. 6) Grease ceramic plate with cooking oil. Roast the beef and vegetables prepared from (1) through to (3). Dip into the seasoned sake prepared in (5) before eating. The cattle of Kobe Beef are raised by stock farmers in Hyogo Prefecture through the full use of advanced fattening methods. Calves bred in Hyogo Prefecture with pedigree registration certificate are fattened in farms designated by authorities. Vivid contrast in the bright red of meat and delicate delicate marble pattern can be found in Kobe Beef, and it has a distinctive flavor. Sake seasoned with salt and acid extracted from umeboshi has an exquisite flavor that is somewhat different from pon-zu. You can enjoy the hint of the color and scent of Japanese plums and its refreshing flavor.